So here’s the deal. P52 is all about taking one photo a week and sharing it. The theme Darcy chose for the week is “Things that grow.” What is growing right now? My garden — I completed two plant exchanges last week. One with my scrapbooking friend Kim — plants for landscape fabric. I have the pallet and the landscape fabric, now to get the soil for this pallet garden that I pinned a while back. I think the height will keep the bunnies away from some pole beans. And while that is not growing quite yet, my other plant exchange yielded two new hostas for me. I wasn’t exactly looking for more hostas, but they were given to me. They are in the ground and looking nice…because they are currently the only hostas uneaten by bunnies. Argh! Those wascally wabbits! 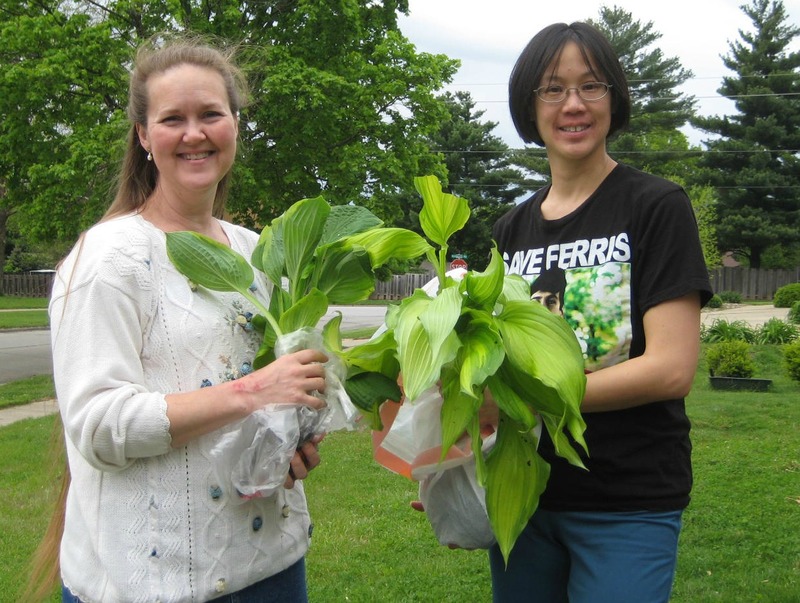 Here is Judi and me with our hostas. I also gave her a lot of other plants. I award myself some Murphy awesome points for having two successful plant exchanges. For the curious: my shirt reads "Save Ferris" as in Bueller. But what is really growing is the hope inside me that my kitchen will be finished. Some day. We’re closer than we were last week because the old linoleum came out today. We have two layers of linoleum on the floor. One white layer on top of a red layer. The red layer is glued down tight, so when our dishwasher leaked, the water was kept between the two layers. This meant that black mold could thrive. The white layer and the “subfloor” below it (above the red layer) were heavy with water. Good news: there was no water damage to the actual wood subfloor. 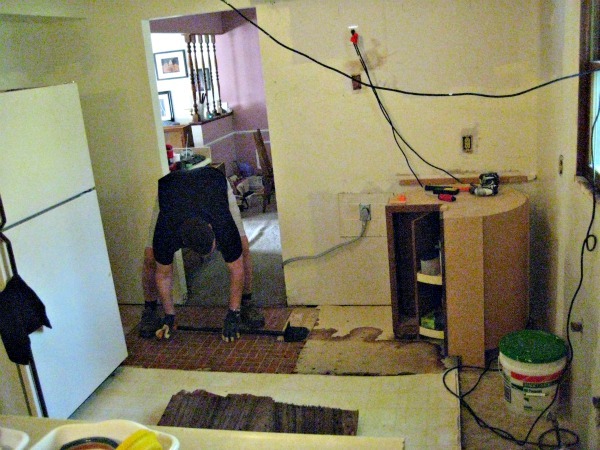 Before the white linoleum was removed, we had a feeling that the subfloor was most likely fine because we couldn’t find evidence of leaking from the basement area underneath the kitchen. The good news here is that the last hard part of this project is finished. This is why I can say that my hope is a thing that grows. Mr. TellBlast and I cleaned up the mold as best we could and removed tacks and staples as best we could. We need the home improvement store to open now. This entry was posted in frugal family, photography and tagged kitchen, p52. Bookmark the permalink. I saw that pallet garden thing…wanna try that one out, too! We had hostas in our yard growing up. Those things are resilient! Though maybe not to bunnies….